So, we've moved seamlessly from HVAC to plumbing. A very particular kind of plumbing -- the sewer line. If you've ever done plumbing above the concrete regions of your house, you might figure plumbing holds no terrors. Lefty loosie, righty tightie, and wash your hands before eating lunch was the entire plumbing handbook when I was a kid. The appendix held one one additional piece of advice: Water always runs downhill. Wanna bet? When the clocks run backwards, when the sun rises in the west, when the lion lays down with the lamb, when politicians start telling the truth, when water doesn't run downhill, when the laws of supply and demand are revoked -- supplying finless brown trout to the porcelain gods and demanding that they go away -- that's when you know you're in for it. You got existential trouble there, Camus, I'm tellin' you. I don't think I can accurately describe what that geyser of excrement in the carhole meant to me at that moment. It was literally an existential threat. If I couldn't figure out what was wrong, almost immediately, we would be homeless. Not fake homeless like an indie-rock drummer sleeping on strange couches. My family and I would not be able, or more to the point, not be allowed to live in our house while I sorted it out. It's fight or flee, and since it was below zero at the time, fleeing only lasts until you get to the end of the street where you re-enact the end of The Shining. I prefer fighting anyway. The first thing you have to get through your head in such situations is that no one is going to save you. Everyone thinks they can act any old way and someone will save them. I eventually got help, but that's not the same as waiting to be saved. The old joke about the lost traveler that sat down and prayed for God to save him is apropos. A man on a camel passes by, but he refuses a ride because God will save him. A man in a hot-air balloon floats by and throws down a rope. The traveler refuses, because God will save him. Things go along like that for quite some time. When the man is about to die of thirst and hunger, he entreats the Lord, "Why won't you save me?" The heavens open up, and a figure in flowing robes appears in the clouds, and booms, "I sent a hot air balloon and a camel driver. What did you want, a sedan chair?" If I wanted to be saved I'd go to snake-handling church. I had to fix my problem. I looked at my older son, and said, "Get it through your head, right now, son. No one will save us. Let's save ourselves." It was superfluous. 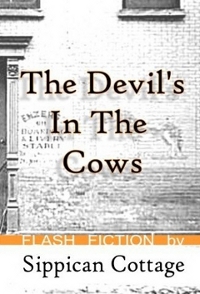 In the nether regions of the carhole, there was an old pipe, plastic, sheared off roughly, inexpertly glued into a 2-inch cast iron knuckle, which in turn was inelegantly rammed into another cast-iron knuckle, which disappeared into the concrete floor. Bad things were coming out of the sheared off plastic pipe. This pipe was as far away from the sewer main as you could get and still be indoors. Someone had decided they needed a sink really badly in this godforsaken, frozen sepulchre, and true to the task, had put one in really badly, then removed it. And now that pipe was jetting the equivalent of 175 meals eaten at a Chipotle franchise located on a Carnival Cruise ship onto my cellar floor every minute. Steps must be taken. Failed donut at the cast iron? Or just fucked no hub? The beatings will continue until morale improves!! Once upon a time, I heard a "drip...drip...drip" of water, and thought, rather lazily, that someone ought to do something about that annoyance. Then I remembered I was on a 65' sailboat halfway between Hawaii and Alaska, and there wasn't supposed to be any drip. It does focus the attention: yes, it does. Now I'm ready for part the third. But you can have another cuppa coffee, if you need. Frozen blockage in the line causing a back up? Let us know how you manage. Whatever the problem is, good luck. You turned that square, plastic nut, din chya? Dood. OK, I'm done funning with you. I've been avoiding putting the new utility faucets in and always look funny at the clerk whenever I'm told to put the plastic into the galv. Every time; for the past dozen trips to hardware world. I still look at them funny. It's a thing I do. But, cast iron and plastic? That's where I draw the line. Except half of my basement looks just like that. Better you than me, partner. I'll be back for part two (and no number two jokes, either). Hi JC- Thanks for reading and commenting. We don't swear much around here, but I'll put a quarter in the jar for you, and play it as it lays. The house I live in is over 110 years old. There were no donuts in the cast iron back then. They used shipbuilding techniques, Either they melted lead in a crucible and poured it in, or they jammed oakum (rope,sorta) into the joint and melted tar over it. Ours had tar, but all of it was long gone. That wasn't the problem. Sewer pipes should work, but leak, if the joints are wide open. You seem to know what you're talking about, so I'll amuse you by telling you all the pipe on the left side of the main trunk in the picture was there to serve an old washer hookup. All of it. Hi Leslie- Our morale is always high because we ain't too bright. Hi Shoreacres- It's always swell to see your name in my comments. You have pointed out a very close approximation of the situation. On a boat, you can go over the side and paddle, or you can fix it. No third option. As far as I know, there were no sharks in the sewer pipe however, so you have me beat. Gerard! Thanks for the link. You know, you're the only commenter that has actually been to my house and used my bathroom. Hmmmm. Hi Phil- Thanks for reading and commenting and wishing us well. It's almost impossible for a sewer main to freeze, even up here where it gets pretty cold. I promise to let you know how we made out. I am familiar with the device you're describing, but it's generally good for things like grease buildups and hair in interior drains. Besides, we have no money and Google doesn't work this far north. There's no one to call and nothing to buy. Hi Casey- Off-topic, but I've enjoyed how bold and brave your paintings have become recently. We did turn the big, plastic nut, and the wye fitting it's inserted in sheared in half. 'Steps must be taken' in the opposite direction in this case. I've often dreamed of digging up long dead plumbers to ask them why they performed such abortions on the plumbing on various old houses I've tackled,I need to upgrade my dreams. "Geysers of Excrement" probably would be a fitting name for the actual Tears for Fears themselves. Plumbers have it easy. All they gotta know is air up, excrement down. Oh, and never tuck shirts in back. Electricians on the hand (we used the other hand on plumbers) have a mysterious metaphysical sorcerer-conjured substance to work with. If you can see it you're in trouble; if you can feel it you are beyond trouble, something about this guy and a boat on the Styx. Plumbing errors cannot be ignored. Shocking as it may seem, electrical errors will not clamor for attention. Tape works well. Watt's that you say? What doesn't break falls off, and what doesn't fall off catches fire. Simple as that. Water runs uphill. Every roofer knows that. Something similar once happened to me in an apartment I was renting. Long story short, I went away for the weekend, and when I returned, large mushrooms were sprouting up all over the carpeting. I woke up to an unexpected geyser once at our place in AZ, but fortunately it was outside and just water. Happy to say I was able to figure out how to cap the pipe all by myself. Had it been sewage, I probably would have curled into a fetal position and had a nervous breakdown instead. "the only commenter that has actually been to my house and used my bathroom....."
True that and you have to admire my use of a very sophisticated and patient timer on my IED.